Dance conventions with The Audience Dance Rivalry offer elite dance classes in, Jazz, Ballet, Hip Hop, Dance Hall, Contemporary and Acrobatics. 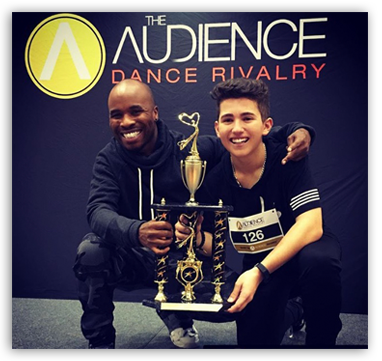 The Audience Dance Rivalry Convention is dedicated to advanced dance education, with the opportunity to show off raw talents to prospects for all aspiring competitive and professional dance artists. At ADR our mission is to allow dancers to engage with an inspirational workshop that will leave the dancer energized and invigorated. Our faculty of Master Teachers and choreographers are devoted to the success of all the participants. Come out and advance your technique at our convention and rivalry & show The Audience what you've got! At the end of the master classes, students are welcome to show off their talent and technique in our Rivalry. While still keeping to the traditions of professionalism, the master teachers will take part in who is capable of participating by choosing 10 dancers from each age division, to qualify for performing to the Audience. The significance of the Audience is that the chosen dancers will perform the choreography they learned in the Rivalry master class, where the Audience will then determine the outcome of our Rivalry by popular vote and process of elimination. One dancer from each age division will win and become champion of our highly prestigious Super Victory Award and Scholarship.